Pressure washing, two coats of stain, and some repairs to cedar siding. "From beginning to end it was a top notch performance. What a great group of workers.! Superb. Prompt, efficient, courteous. Our house didn't look this good when brand new." Powerwash house and deck. Replace siding with woodpecker holes. Replace rotted trim boards with plastic boards. Paint house and trim with 2 coats Powerwash deck and paint 2 coats with marine paint that matches house. 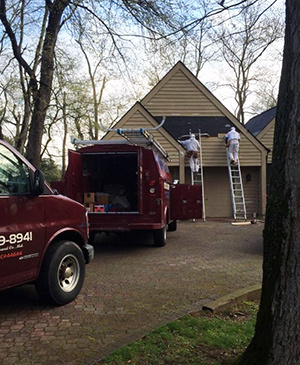 "Wockenfuss painting is everything you want in a contractor. Honest, reliable, fair price, responsive, and professional. He and his workers show up when the say they will, do the work professionally, and are proud of the final product. I highly recommend them for house and deck work."